So much of your marketing depends on “your audience.” Who are the likely readers for your book? Can you explain who makes up your audience? Describe them in general, then in detail? Where do they “hang out” and how do you relate to them…as a group and individually? “Finding Your Audience” will help you identify and devise plans to make connections to your ideal reader/audience. 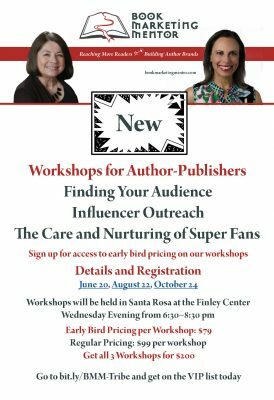 June 20, 2018, 6:30-8:30 p.m. at Finley Center, Santa Rosa. 2060 West College Ave.
Two more workshops for author-publishers will be held August 22 and October 24.